Tandy's updates have been coming faster than I can post them. Here's #14 in his series on the 900 square inch Cloudster. The fin detail looks pertinent to a lot of other designs. 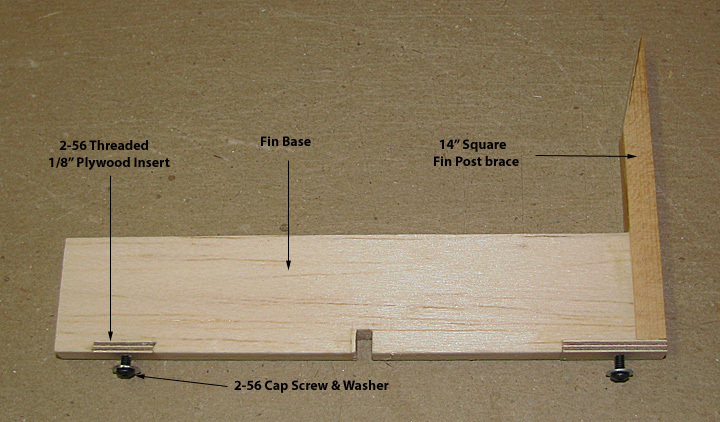 The fin base is a 1" piece of 1/4" balsa sheet that slips down into the stab center slot. Notice the cut out for the stab's 1/8" center spar. 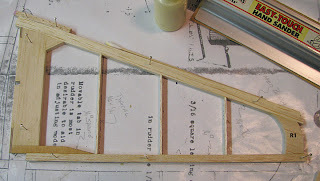 Two 1/8" X 1/4" plywood rectangles were cut to size, drilled, tapped with 2-56 threads, and glued into the bottom of the fin base as shown below. 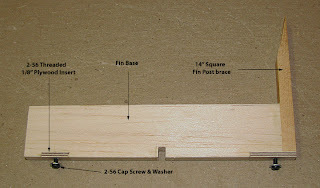 A 1/4" square fin post spruce brace was cut to length, tapered, and glued to the rear of fin base as shown below. The two 2-56 cap screws are used to secure the fin base in the stab slot as will be shown later. 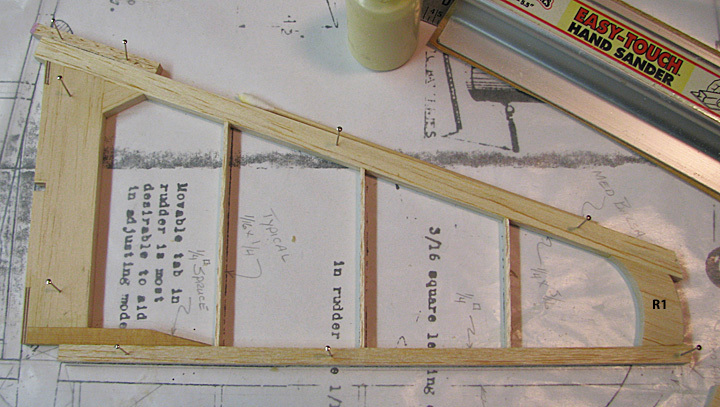 To start the fin framing, the fin's 1/4" X 5/16" leading edge and 1/4" square rear post were pinned down and the R1 tip piece was glued in place as shown below. 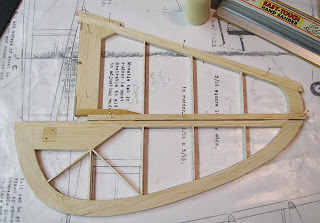 A slope was cut on the leading edge of the fin base, which was then glued in place to the fin's leading edge and rear post as shown below. 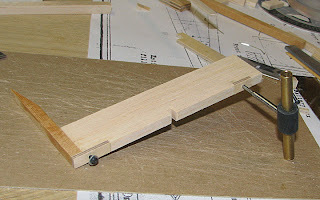 Notice the forward 1/4" gusset that reinforces the joint between the leading edge and the base. Finally the three 1/16" X 1/4" strips were glued in place as ribs. The rudder was lined up on the pinned down fin with a 1/16" gap for the hinge line and the picture below was taken so you could see what the complete vertical tail will look like.